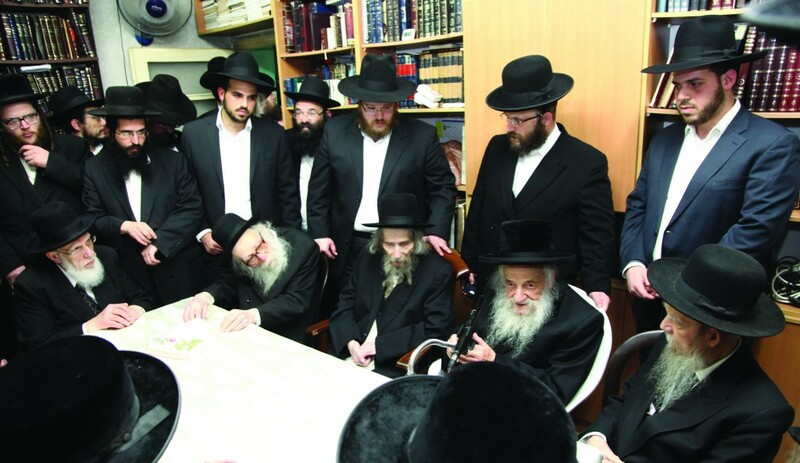 A meeting of the Vaad Hayeshivos of Eretz Yisrael regarding the draft threat looming over the bnei yeshivah in Eretz Yisrael took place at the home of Hagaon Harav Aharon Leib Steinman, shlita, on Tuesday. L-R: Hageonim, shlita, Harav Shalom Cohen; Harav Nissim Karelitz; Harav Steinman; Harav Shmuel Wosner; Harav Gershon Edelstein. He said that in the times of the Chasam Sofer, zy”a, there was a draft decree issued against Jewish bachurim. It was a very difficult time for Klal Yisrael. The Chasam Sofer entered the beis medrash, drew open the aron kodesh, and burst into bitter tears. ‘What do You have from it, Father, that we have been sent to exile, as now we have to enlist?’ And all this took place out of Eretz Yisrael, about two hundred years ago. He expressed the hope and prayer that Hashem will help and that the terrible plans of those who want to draft yeshivah bachurim will not come to fruition, and the Torah world will be unscathed. The resolutions of the meeting were read by Attorney Eliezer Etzioni: “The Vaad Hayeshivos expresses deep pain and distress at efforts by people who have never tasted the flavor of Torah to pass terrible decrees against the yeshivos in Eretz Yisrael and to reduce the number of people learning. The Vaad vigorously objects to all these efforts. “The Vaad Hayeshivos is appealing to the government and reiterates that Am Yisrael, since its inception as a nation, has always made great strides in Torah learning despite all the challenges and difficult situations it has faced. The meeting was attended by Harav Aharon Leib Steinman, shlita, in whose home it was held; as well as Hageonim, shlita, Harav Nissim Karelitz; Harav Eliyahu Shmuel Schmerler; Harav Shaul Alter; Harav Menachem Ernster; Harav Gershon Edelstein; Harav Chaim Wosner; Harav Moshe Shaul Klein and Harav Shalom Cohen. Harav Baruch Mordechai Ezrachi, shlita, and Harav Shmuel Rosengarten, shlita, were unable to attend personally and sent letters indicating their support. The members of the Vaad decided to appoint Harav Chaim Aharon Kaufman as director of the Vaad Hayeshivos to succeed his father-in-law Harav Asher Tennenbaum, zt”l, who passed away several weeks ago. Divrei azkarah on Rabbi Tennenbaum were delivered. After the meeting, Harav Kaufman visited the homes of Harav Chaim Kanievsky, shlita, and the Vizhnitzer Rebbe, shlita, Harav Yisrael Hager, and received their brachos in honor of his new position. This article appeared in print on page 1 of the February 28th, 2013 edition of Hamodia.